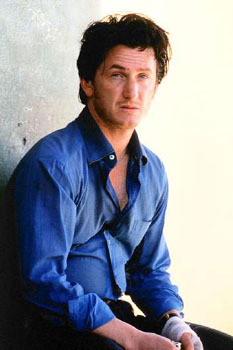 Sean Penn is a craggy-faced actor and loudspoken liberal activist. He played the stoner Spicoli in Fast Times at Ridgemont High, married and divorced Madonna, has famously brawled with paparazzi, denounced George W. Bush and Bill O'Reilly as traitors, won an Oscar for Mystic River, and scolded Trey Parker and Matt Stone for making Team America: World Police. Penn's father was a TV director, and his mother was an actress. Growing up in Hollywood, young Penn befriended Charlie Sheen and Emilio Estevez, whose father Martin Sheen lived around the corner. Penn made his professional acting debut at 14, in a 1974 episode of Little House on the Prairie directed by his father. He has a permit to carry a concealed weapon, but left his pistol behind when he went to Iraq before and after its 2003 war with the United States. While in the Middle East, Penn spoke against war and filed reports for the San Francisco Chronicle. In August 2007, Penn drew criticism for meeting with Venezuealan President Hugo Chavez, citing America's tend of "becoming increasingly gullible to the demonizing of foreign states or leaders." Penn has also written and directed two films, The Indian Runner and The Crossing Guard, and directed another, The Pledge. All were generally well-received by critics, but barely noticed at all by audiences. At Close Range (18-Apr-1986) · Brad, Jr.